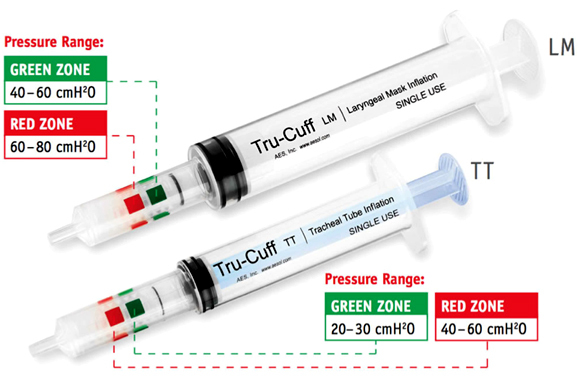 The Tru-Cuff Syringe by AES indicates cuff pressure while inflating the cuff and allows for easy monitoring of cuff pressure throughout the procedure. Tru-Cuff takes the guess work out cuff inflation. Over inflation can cause trauma. Under inflate and the airway doesn't seal properly. Each airway is different and Tru-Cuff eliminates the guesswork. Easy to read color indicator bands provide at a glance feedback.